I'm sure you're all familiar with the pain of coming across a beautiful swatch of a polish that's no longer in production. 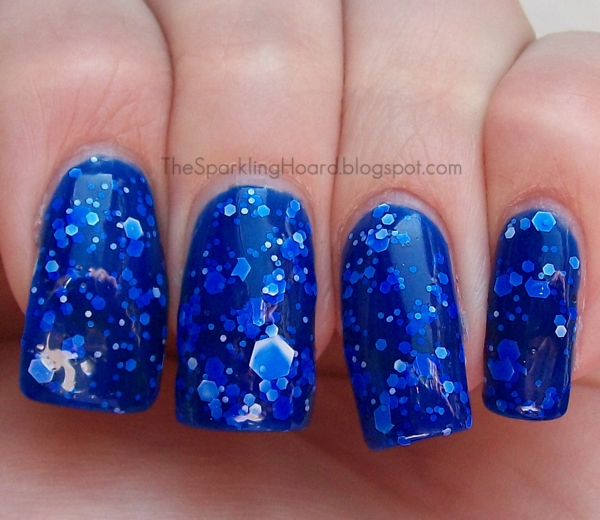 I was super bummed when I discovered that Nail-venturous Lacquers no longer existed and that I'd never be able to buy Nail-venturous Flying Blue Jay. Thankfully, after digging around a bit, I discovered that Liquid Lacquer makes a very similar polish called Mockingbird! 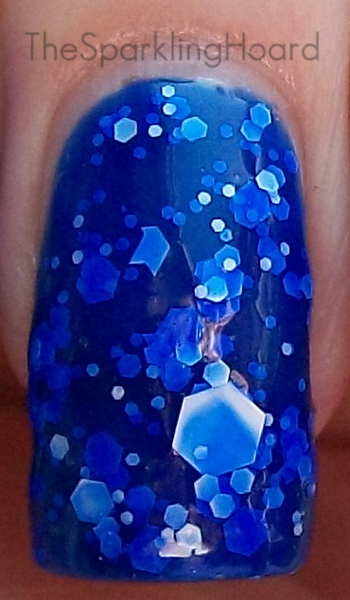 Liquid Lacquer Mockingbird features four sizes of white hex glitter in a bright, royal blue jelly base. The formula was good and the polish was gorgeous, but I wish that there had been more of the large white hex glitters. Dry time was average. Shown is 3 coats. You'll probably want to do a coat of Glitter Food or Gelous followed by a thick, fast-drying top coat like Seche Vite to completely smooth things out. I think I just did one coat of Seche Vite because I'm generally not super finicky about smoothing out glitters. Based on swatches I've seen of Nail-ventrous Flying Blue Jay, Liquid Lacquer Mockingbird is very similar to it, but not a dead-on dupe. I think the smallest glitters in Flying Blue Jay may be smaller than the small glitters in Mockingbird. 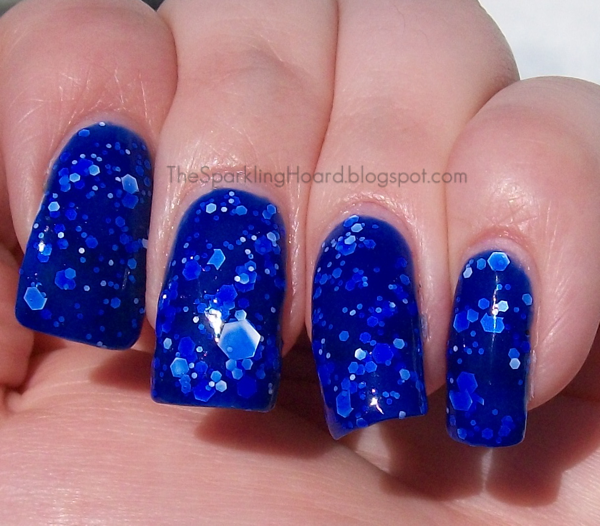 Flying Blue Jay also has blue microglitter and shimmer, which are not found in Mockingbird. Additionally, Flying Blue Jay seems to have more of the smallest and largest sizes of glitter, while Mockingbird is dominated by the two medium sized glitters. Despite the differences between the two, I think Mockingbird is a really great substitute for Flying Blue Jay! Liquid Lacquer Mockingbird costs $8 for 15mL and can be purchased HERE. You can stay up-to-date on Liquid Lacquer news and restocks by Liking them on Facebook HERE. Yup! Liquid Lacquer definitely did a great job on this one! Oh, and make sure that you get Seche Vite or something too, since Gelous and Glitter Food are both thick, slow-drying, and squishy. Without a fast-drying topcoat, your mani could be dentable/squishable forever!